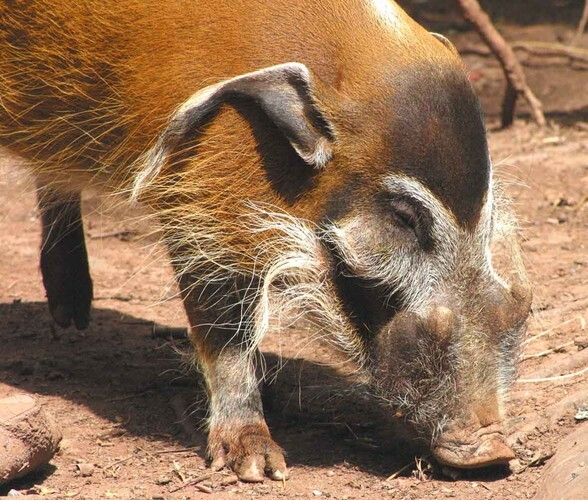 One of my readers recently requested a post about pigs, so I found out about this unique and beautiful pig found in the forests of Africa called the red river hog. They are the smallest type of pig to be found in Africa, growing up to 150 centimetres long and can weigh up to 120 kilograms. The are omnivores, eating roots, fruit, berries and small mammals, reptiles and any dead animals that they find. They have an excellent sense of smell. They use their snouts to sniff out their food and then dig it up. Like most pigs, they grow tusks. The lower tusk of the red river hog is very sharp and can grow up to 7 centimetres long. They live in small family groups of 6-15 called “sounders” and have 3-4 piglets at a time. The piglets have stripes on their bodies which helps them to hide in thick grass. They are very common throughout the forests of Western Africa and besides people, their main predators are leopards. Are there any other interesting facts that you would like to share about red river hogs?